This is a Welsh version of the Health and safety law poster. You may want to use this version of the Law poster to display at your work premises if your staff are predominantly Welsh speaking. It tells workers what they and their employers need to do in simple terms, using numbered lists of basic points. 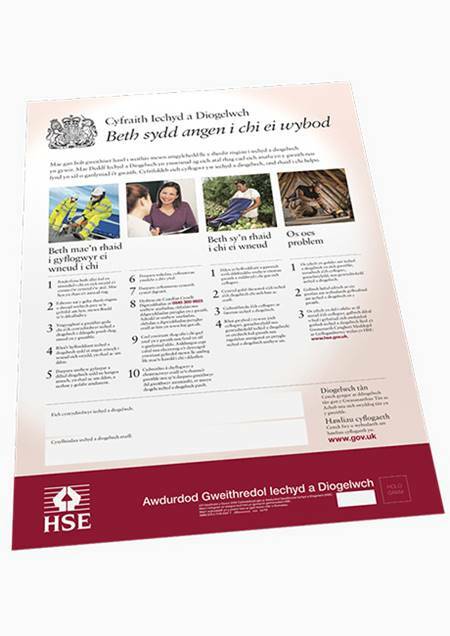 All employers have a legal duty under the Health and Safety Information for Employees Regulations (HSIER) to display the poster in a prominent position in each workplace or provide each worker with a copy of the (free to download) equivalent leaflet, which is also available in hard copy.